On November 9, 2018, two days before the 100th anniversary of the end of the First World War, the Vimy Foundation will open the gates to a modern living memorial in commemoration of the centenary of the armistice of the First World War, the first of its kind. The Vimy Foundation Centennial Park located adjacent to the Vimy Memorial at Vimy Ridge in France will welcome visitors to walk its paths of remembrance surrounded by over 100 Oak trees repatriated back to Vimy from Canada. Centennial benches, built in Canada and placed throughout the park, provide an opportunity for gathering, dialogue, and extended reflection, all essential elements to conflict resolution and peace that the monument inspires. Built on private farmland purchased by the Vimy Foundation, the land has required extensive demining and preparation prior to creation of the park. Through the land preparation process, many artifacts were discovered including shells (some of which were still active), grenades, fuses and communications wires, as well as the remains of soldiers who fought at Vimy Ridge over 100 years ago and who have now been put to rest in an official military graveyard. As a living memorial and park, the four-acre Vimy Foundation Centennial Park is both a public green space for neighbouring communities as well as a place for remembrance and education. The Park highlights the natural bonds between France and Canada, the desire for peace, our responsibility to remember and was designed by acclaimed Canadian Landscape Architect Linda Dicaire. Some major components of the Vimy Foundation Centennial Park include, the repatriated Vimy Oaks (picked on the battlefield in 1917 by a Canadian soldier, grown in Canada, and now brought back to France) provided by the Vimy Oaks Legacy Group, and the Bugler Memorial Sculpture designed by renowned Canadian artist Marlene Hilton Moore and gifted by the City of Barrie and the communities surrounding Canadian Forces Base Bordon. The Borden Centennial Bugler is one of two, a twin statue stands at the entrance to CFB Borden. The buglers call out across generations, across geography to each other and to the now-empty trenches that once trained soldiers before they left for battle overseas. 100 years later, the First World War continues to demonstrate its ongoing impact, scarring the soil of the battlefields. The story of the creation of the Vimy Foundation Centennial Park showcases the devastating impact the First World War had not only for the soldiers and the countries involved, but also on the land where the battles took place. The Vimy Foundation Centennial Park would not have been possible without the generous support of public and private organizations and individuals from across Canada, in particular lead sponsor The Province of British Columbia, Centennial Flagpole sponsor Molson Coors, and the sponsor of the Bugler Memorial Sculpture, CFB Borden. On October 18, 2018, Stephen Brunt of Sportsnet and Bob Weeks of TSN spoke with assembled guests at the Manitoba Sports Hall of Fame about the important role of sports and entertainment during the First World War. And they played many different types of sport while in the military. A makeshift game of cricket, a rugby match: these were common for many of the British troops and Canadians at the time. Football (soccer to most North Americans these days) was the most popular pastime on both sides of the lines, and only needing a ball and some goal posts certainly made it easy to create a match. 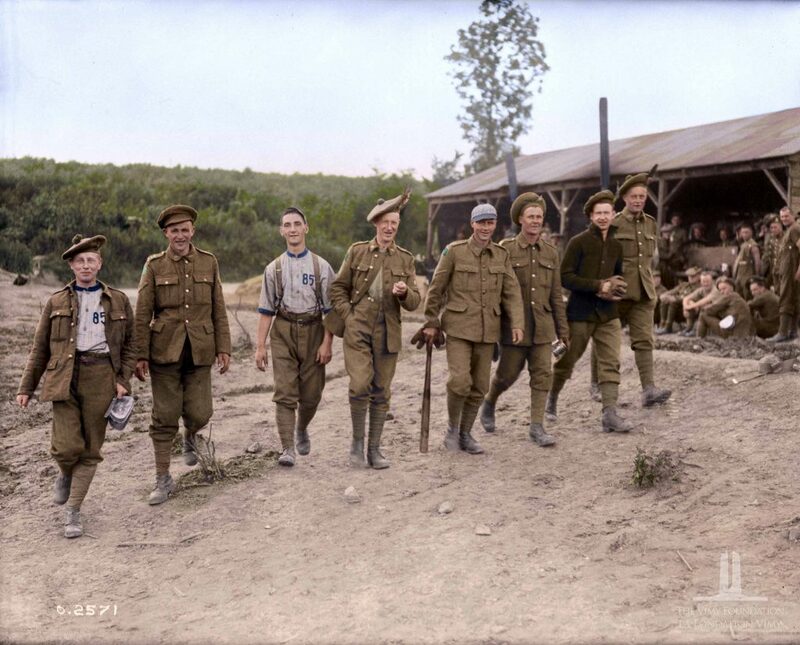 Nova Scotians returning to camp after a game of baseball, Feb 1918. Library and Archives Canada / PA-002464. (modified from the original). Provided by The Vimy Foundation. 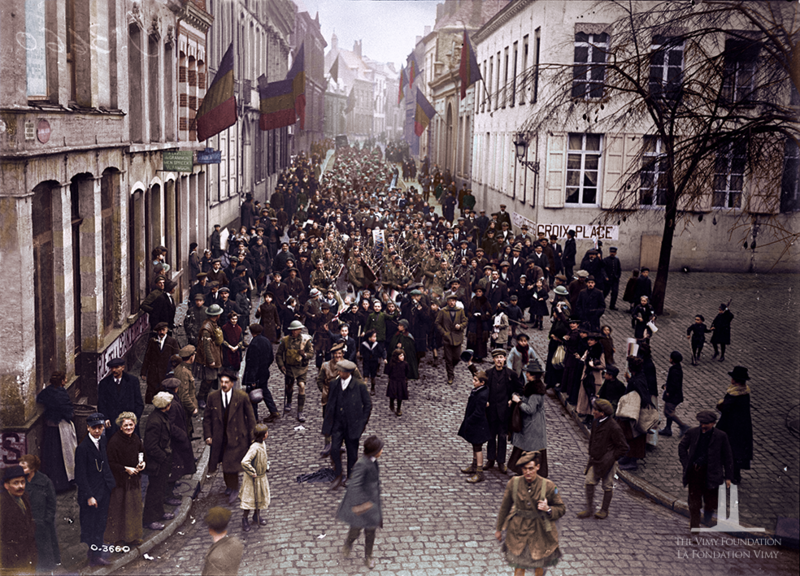 Colourization by Canadian Colour. Learn more about Alex Decoteau in reading his service file from Library and Archives Canada. 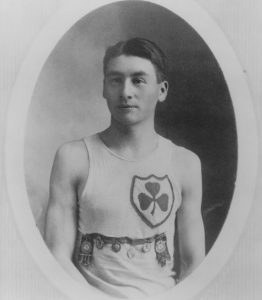 Alex Decoteau, courtesy of the Saskatchewan Public Archives. 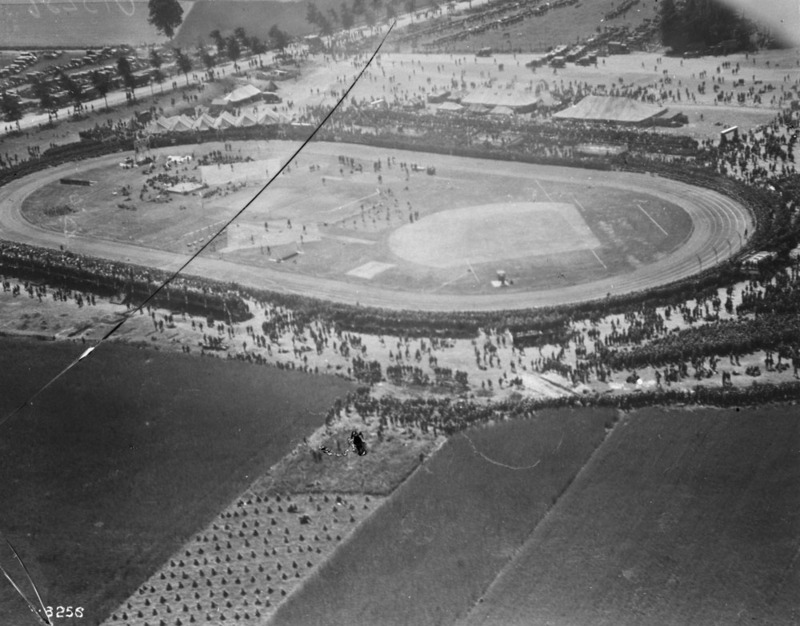 On Dominion Day during the last year of the war, fifty thousand Canadians assembled for sporting events at Tincques, fourteen miles west of Arras, in northern France. It was the Canadian Corps Championships of July 1, 1918. Engineers had put together a stadium, VIP platform, and theatre stage. Many distinguished guests attended, including Sir Robert Borden, General John J. Pershing (Commander-in-chief, American Expeditionary Forces) and the Duke of Connaught, with Lt.-Gen. Arthur Currie as the Honorary President of the event. The Canadian YMCA provided the equipment and décor, and catered the refreshments for the non-officers. The events of the day included more traditional sports competitions – foot races, baseball, boxing, lacrosse and tennis – as well as more unusual and fun events: pillow fighting, sack races, and tug-of-war. The winners of the baseball game, Canadian Sports Championship Meet. July, 1918. PA-002836 Canada. Dept. of National Defence/Library and Archives Canada. The Dumbells entertained Canadian troops during war with music and comedy, and enjoyed such popularity that they continued touring for years after the war ended as well. You can catch a glimpse of what their musical comedy entailed by watching a tribute performance from Soldiers of Song, based on the original works of the Dumbells. – The Olympic Games is mentioned multiple times here. Athletes would have travelled to other parts of the world to compete against other countries in sports. Contrast this with their experiences travelling overseas to fight a war. Both war and the Olympics are often discussed through a lens of ‘nationalism’. Would there be a similar pride in one’s country? How would this change from a sporting competition to a war? – Do you agree with Bob Weeks’ suggestion that athletes enlisted in the Canadian Expeditionary Force to be heroes? Why or why not? What does it mean to be a hero in wartime? What does it mean to be a hero in times of peace? 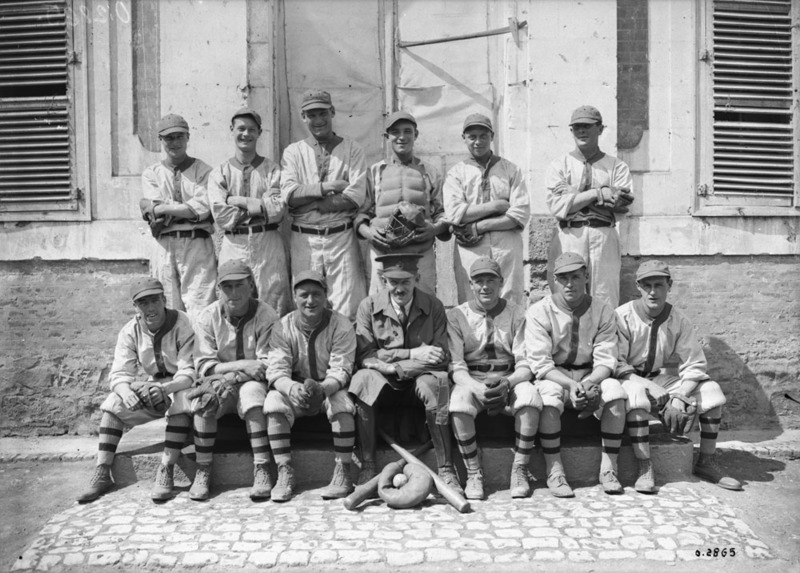 – Sports helped keep soldiers in good physical condition, and helped with physical therapy as they recovered from injuries. Why would music and comedy have been important to soldiers? – Why was it so important to his fellow soldiers that they recover the silver watch of Alex Decoteau? How do you imagine that they felt being able to send it home to his mother?